A combination blackjack and video poker game. PLEASE NOTE: The NOISY VIDEO BLACKJACK manual follows the NOISY VIDEO POKER manual. Noisy Video Poker for Windows is copyrighted and owned by Ultimate Software. You are granted a license to evaluate this product for up to 30 days. If you use this product beyond that 30-day evaluation period then you must register. Failure to do so is a violation of copyright law. Noisy Video Poker for Windows is similar to the video draw poker machines found in casinos. The objective is to hold the best five card hand possible. A pair of jacks or better will return the amount of your bet. Two pair, three of a kind, a straight, a flush, a full house, four of a kind, a straight flush, and a royal flush return increasingly greater pay-offs. If you have no pairs or a pair of cards of lower value than jacks, you lose your bet. Why do we call it NOISY VIDEO POKER? It won't take you long to figure that one out! If you have a sound card, you will be treated to a variety of sounds during the game. When you win, you will hear coins dropping a metal coin tray. When you lose, other sounds are played randomly. There are explosion sounds, a car crash, a donkey, and other sounds. These sounds certainly add to the entertainment value of this product, however, the best features of Noisy Video Poker are the beautiful card designs, fast play, and easy-to-use user interface. Registration is only $20 and gets you the registered and enhanced version of this program. The enhanced version allows you to record and display your playing stats, turn the sound on or off, and gives you unlimited credits. You also get a JOKERS WILD and DEUCES WILD version of the video poker program. For an extra $5 ($25 total) you can also order the registered version of NOISY BLACKJACK for Windows. That saves you $15 because the VIDEO BLACKJACK program is $20 if ordered separately. What a deal! To print a registration form, click on the Register button. This will bring up a Print button. Click on it to print the registration form. To register, call 1-800-925-3147 for VISA or MasterCard orders. Please do not call our 800 order number for technical support. The staff at that number cannot help you. For technical support call our customer service department at 317-759-6852. It is best if you are at your computer when calling. 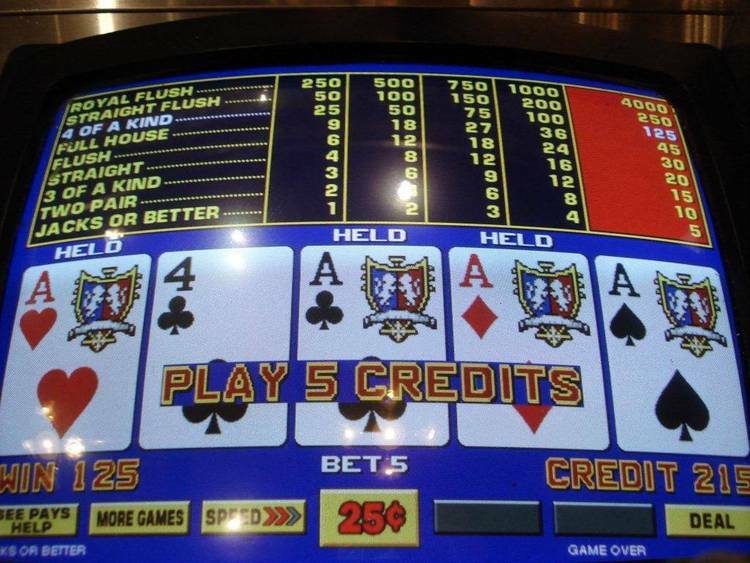 From the main menu click on the graphic image of five playing cards to run Noisy Video Poker (NVPOKER) for Windows. You can also click on the graphic image of two playing cards to see a demo of Noisy BlackJack for Windows. When you first run NVPOKER, simply click on one of the five coin buttons. If you wish to bet five coins, click on the button labeled "5." After the first deal, you can left click on the deal button or simply right click anywhere on the blue background to deal subsequent hands. After you are dealt five cards, you must choose which ones you wish to hold and which to discard. You do this by clicking with either button on the cards you wish to hold. Then left click on the draw button (or right click on the blue background) to draw new cards for the ones you have chosen to discard. If you now hold a winning hand, you will be paid instantly. The payoffs always appear at the top of the NVPOKER screen. The payoffs are based on a certain payoff for each type of winning hand multiplied by the number of coins you have chosen to wager. The only exception is a royal flush with five coins bet; this pays a huge bonus. Royal flushes are rare, but your heart will start beating a little faster if you get one, even thought this is a simulation with no money actually wagered. JACKS OR BETTER is the easiest winning hand to get, but it pays back only the amount of your bet. You get back your bet, so you really don't win anything. If you have two jacks, queens, kings or aces, then you have jacks or better. TWO PAIR pays back twice your bet. If you have two pair of any card, you win. Neither of the pairs have to be jacks or better. A pair of twos and a pair of threes pays the same as a pair of aces and a pair of kings. THREE OF A KIND pays back three times your bet. This can be three of any card value. Three twos pays the same as three kings. A STRAIGHT pays back four times your bet. A straight is a consecutive series of five cards. The ace is a special card which can both precede the two in a series or follow a king. One example of a straight is a five, six, seven, eight, and nine card. Note: you simply need to posses five cards that make up a consecutive series; they don't need to appear in order on the screen. A FLUSH is five cards of any value which are all of the same suit. You can have five clubs, five hearts, five diamonds or five spades. A flush pays back five times your bet. A FULL HOUSE pays back eight times your bet. A full house is three of a kind plus a pair of cards of another value. For example, three fives and two jacks would be a full house. If you had two pair after the deal, you would want to hold the four cards that make up the two pair. When you then draw one card, you will be hoping for it to match one of the pairs which you are holding. If it does, then you have a full house, otherwise you would have two pair which pays substantially less than a full house. FOUR OF A KIND is a very good hand which pays back 25 times your bet. If you bet five coins and get four of a kind, you get to hear the machine go crazy spitting out 125 coins! Four of a kind can be all four of any one card value. Four twos pays the same as four aces. A STRAIGHT FLUSH pays back 50 times your bet. To get a straight flush you need all five cards to be in a consecutive series (a straight) plus be all of the same suit (a flush). If your straight flush consists of a ten card, jack, queen, king, and ace, then you have a royal flush which pays even better than other straight flushes. A ROYAL FLUSH is the ultimate hand you can posses in poker. A royal flush consists of a ten, jack, queen, king, and ace all of the same suit. A royal flush pays back 200 times your bet. However, if you bet five coins, there is a bonus, and you are paid a total of 4000 coins! If you get one, you will start screaming for your whole family (and maybe even your neighbors) to come and see it! A very special thanks to Stephen Murphy for allowing us to use his QCARD.DLL 2.0 for this project. Without it, NVPOKER would have been much harder to complete, and the results wouldn't have been nearly as good. Noisy Video BlackJack for Windows is copyrighted and owned by Ultimate Software. You are granted a license to evaluate this product for up to 30 days. If you use this product beyond that 30-day evaluation period then you must register. Failure to do so is a violation of copyright law. Noisy Video BlackJack for Windows is similar to the video blackjack machines found in casinos. When you win, you hear coins dropping into the metal coin tray. But why do we call it NOISY? If you have a sound card (recommended but not required), you will quickly find out! The included sounds bring a smile to your face even when you lose. Even though the sounds add greatly to the entertainment value of this program, the best features are the beautiful card designs, fast play, and easy-to-use user interface. Registration is only $20 and gets you the registered and enhanced version of this program. The enhanced version allows you to record and display your playing stats, turn the sound on or off, split pairs, buy insurance, and gives you unlimited credits. For an extra $5 ($25 total) you can also order the registered version of NOISY VIDEO POKER for Windows. That saves you $15 because the VIDEO POKER program is $20 if ordered separately. The registered version of NOISY VIDEO POKER comes with JACKS OR BETTER, JOKERS WILD, and DEUCES WILD versions of draw poker. What a deal! To print a registration form, click on the Register button. This will bring up registration information and a Print button. Click on it to print the registration form. Please Note: NOISY VIDEO BLACKJACK plays with two decks and will continue to deal without shuffling until the cards remaining in the undealt pile are less than 20. From the main menu click on the graphic image of two playing cards to run Noisy Video BLACKJACK (NVBJ) for Windows. You can also click on the graphic image of five playing cards to see a demo of Noisy Video Poker for Windows. When you first run NVBJ, simply click on one of the five coin buttons. If you wish to bet five coins, click on the button labeled "5." After the first deal, you can click on the deal button (the button with an ace and jack located on the bottom far-left of the screen) or click on one of the coin buttons to deal subsequent hands. The computer will deal you two cards face-up and the dealer will get two cards, one face-up and one face-down. If the dealer has an ace showing, an insurance button will appear at the bottom of the screen. If you buy insurance, you will be paid 2-1 on your insurance bet if the dealer has blackjack (an ace plus either a ten or a face card). If the dealer or you have blackjack after each has been dealt two cards, the hand will end with no more cards being dealt. If both the dealer and you have a blackjack, it is a push (a tie). If the dealer has blackjack and you don't, then you lose your bet. If you have a blackjack and the dealer doesn't, you win. A blackjack pays 2-1; you get back your bet plus two times your bet. If no one has a blackjack, the hand proceeds with you choosing whether to hit (take another card) or stand. Based on what cards you have and what card the dealer has showing, you may wish to take more cards. If your first two cards are of the same value (like two jacks or two kings), you may wish to split the pair. If your first two cards add up to 9, 10 or 11, you may wish to double-down. If your cards add up to less than 16, and the dealer has a ten or ace showing, you will want to hit (see strategy). You can continue to hit as long as your cards equal less than 21. If your cards add up to more than 21, you bust, the hand is over, and you lose your bet. See below for more about Strategy, Doubling-Down, Splitting Pairs, BlackJack, Aces, Pushes, and Insurance. Once you are happy with your cards and decide not to hit any more, the dealer will play his cards. The dealer must play his cards in a certain way. The dealer must hit if his cards add up to less than 17. If the dealer has a soft 17 (because of an ace), the dealer must hit. If the dealer busts (exceeds 21) while taking cards, you win. If the dealer doesn't bust, then whoever has the highest hand wins. If you win, you keep your bet, plus win the amount of your bet. If your cards and the dealer's cards have the same value, it is a push. Aces are worth either 1 or 11. If you have a six and an ace you have 17. However, if you then hit and get a ten, you still have 17. Before hitting you had a soft 17. After you hit, you had a hard 17 because your ace was now at its minimum value of one. A blackjack is two cards which add up to 21. If you have more than two cards which total 21, you have a very good hand, but not a blackjack. Blackjacks pay 2-1 in this version. If you bet five coins and get a blackjack, you keep the five coins you bet and get ten more back. If the dealer has a blackjack, you lose, unless you also have a blackjack in which case you push (you keep your bet but don't win anything). If your first two cards add up to 9,10 or 11, you can double-down. If you choose to double-down, your bet is doubled and you get only one more card. If you end up winning, you double your winnings, otherwise, you lose twice as much. When the dealer has an ace showing on the deal, you have the option to buy insurance. Insurance is a side bet. If you place an insurance bet, you win if the dealer has blackjack. Insurance pays 2-1 which means you get your insurance bet back, plus twice your insurance bet. Insurance being a side bet doesn't affect your hand. If the dealer has blackjack (and you don't) you still lose your hand. If the dealer doesn't have blackjack, the hand is still played out like normal. When you and the dealer have cards that add up to the same number, it is a push, and you get back your bet but don't win anything. If your first two cards are the same, you can split the pair and play them as two separate hands. If you choose to split a pair, your bet is doubled because you are playing two hands. If you have a pair of aces, you only get one more card per ace. If you have other than aces, you can play each hand like normal. When you split a pair, you can't get a blackjack, even if you split aces and get a ten dealt to each. That would be a 21, but wouldn't be considered a blackjack. This is a very basic guide to blackjack strategy. You may or may not wish to play according to this strategy. You can play any way you like within the rules. Your strategy should be based on what card the dealer has showing. The goal is to beat the dealer, not necessarily to get as close as you can to 21. You have to balance the goal of getting a hand close to 21 with the threat of busting. Sometimes it is better to wait for the dealer to bust, than to take a chance on busting yourself by hitting. If the dealer has an ace showing and you believe that there are a lot of tens (meaning actual tens or any face cards) remaining in the deck, you should buy insurance. If the dealer doesn't have a blackjack, you should hit if you have less than hard 16. You should hit on a soft 16. You should hit only if you have less than 16. If you stand with less than 17, you are hoping to win by the dealer busting. You should hit only if you have less than 15. Stand on 15 or better. You should hit only if you have less than 14. Stand on 14 or better. There is a good chance that the dealer will end up busting, so you want to be careful not to bust yourself. Hit only if you have less than 12. Stand on 12 or better. You should hit only if you have less than 13. Stand on 13 or better. A very special thanks to Stephen Murphy for allowing us to use his QCARD.DLL 2.0 for this project. Without it, NVBJ would have been much harder to complete, and the results wouldn't have been nearly as good.